We asked each of our blockage remediation specialists just what it takes when dealing with blockages. 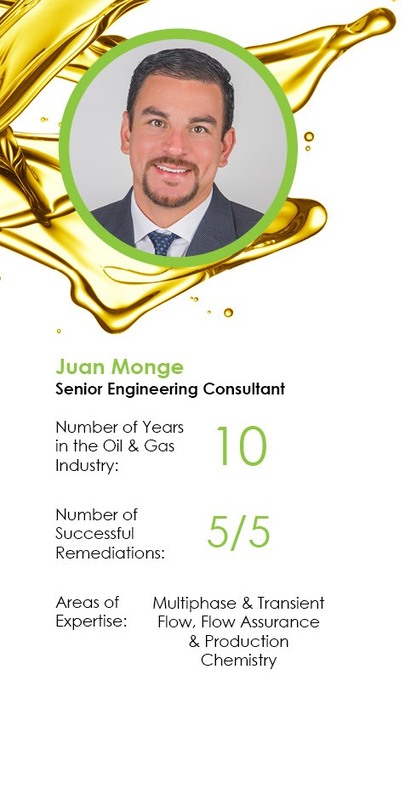 Juan Monge is one of our lead engineers with GATE Energy’s Flow Assurance Team. What’s your proudest accomplishment with regards to blockage remediation? My last remediation was especially rewarding since I was in-country (West Africa) at the time of remediation and was able to see and hear the relief from the operations team on/offshore. We were down to our last efforts utilizing the permanent facilities before we would have had to move to mobilizing intervention equipment. What big numbers/results have you helped your Clients achieve? We were recently approached by an operator who was in the early stages of planning to mobilize intervention equipment. After our initial assessment, we identified that the blockage was likely not as close to the tree as originally suspected and an opportunity existed to remediate from the platform. Not only did we save a large sum of money by not having to deploy the intervention equipment, but we also very likely avoided a failed intervention attempt from the subsea end. What’s the most difficult challenge you have had to deal with when it comes to blockage remediation? When it comes to blockage investigation / remediation, the devil is truly in the details and requires a very good understanding of the system, events leading up to the blockage and operations undertaken since the blockage was first encountered. Achieving this complete understanding can be especially challenging when data is not available or if multiple stakeholders are involved. How would you describe your team and the people that you work with? We are all very detail oriented and have technical expertise in all of the various flow assurance issues encountered. We also want nothing less than success for our clients and the projects we are fortunate enough to support. Attacking each and every project with this mentality along with our technical knowhow has proven to be a consistent recipe for success.